Despite the phenomenal economic growth the country has witnessed in recent years, chronic unemployment has become a pervasive feature of rural India. The current economic downturn has worsened the plight of rural people, aggravating loss of livelihood, poverty and social disturbances. A movement towards a green future, predicated on enhancing the use of renewable resources and mitigating the adverse affects of climate change, could provide impetus to the forest sector, create real and durable assets and help rescue rural India from this crisis. The viable investment in forestry sector keeping economical and ecological soundness in view may create village level employment for rural youth. 1. Forestry resources should be linked with economy. Economic valuation of forest resources should be done in such a way that true contribution of the sector could be understood. 2. Cooperation and mutual trust development between researchers and rural communities. 3. Identification of suitable partner/local extension workers is necessary for dissemination of knowledge. 4. Skill development of local communities to enable them to start own entrepreneurship. 5. Utilization and value addition of locally available resources for employment and livelihood generation. 6. Linking of Van Panchayat in different developmental activities. 7. Development of socio-economic business model for the benefit of rural poor. 8. Extension Centres should be established for dissemination and demonstration of technologies/innovations as per need of local communities/stakeholders. 9. Medicinal plants based agroforestry practices should be encouraged according to market demand. 10. There should be a mandatory provision for authorization of FRI for quarantine for forestry species to obtain quality planting material. 11. Micro level utilization of forest produces should be provisioned and local industries like Match, wooden spoon, ice stick should be established where the raw material is available in plenty. 12. It should be taught to youth that the education is not confined up to degree only and knowledge should be linked with wisdom to create Skill and Excellency. 13. In developmental activities economy and ecology should be balanced in any condition. About 70 personnel including representative of Non Government Organizations, Self Help Groups and members of Civil society organizations participated in the seminar. Among distinguished persons who attended the seminar were Shri Jagat Singh Jangali (Brand ambassador of Uttarakhand Forest Department), Raghbeer Kandwal (Gramin Sudhar Evam Shramik Seva Sansthan (GRASS), Swami Bhaskaranand Maharaj, Shri Premji Kashyap, Smt. Immi V. Marla from Germany and Shri Sameer Raturi and others who expressed their views on the subject and had shared their experiences in the field. All head of Divisions, Dean & Registrar FRIDU, Chief Librarian and Group Coordinator Research were also actively participated in the deliberations of the seminar. 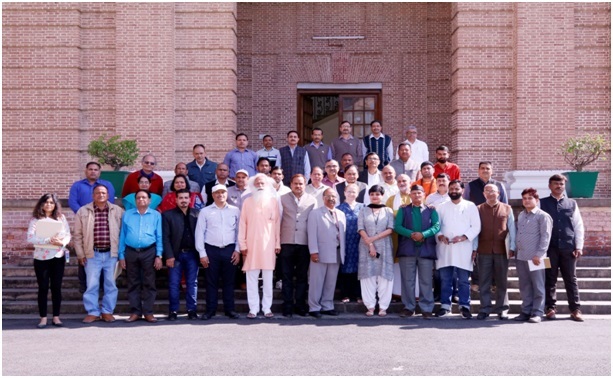 The team of Extension Division including Dr. Charan Singh, Dr. Devendra Kumar, Shri Rambir Singh and Shri Ajay Gulati and Dr. K. P. Singh, Public Liaison Officer and his team managed the seminar programme with full dedication.